CrossFitters exercise at a gym in Travis, N.Y. A blog posted to CrossFit's Facebook page has opened up a discussion about diversity in the CrossFit community. Last week, the headquarters for CrossFit, the popular — and polarizing — workout genre, shared an item on its Facebook page from a blog called Stuff Black People Don't Like. "Crossfit 'boxes' usually charge expensive membership fees and boast a mostly white clientele. A list of Crossfit Games champions and competitors reveals a veritable whitopia. In the past two years, the male and female champions have repeated. The male champion, the 'world's fittest man,' is a white Southerner that Django hasn't gotten around to killing yet, who indulges his white privilege every day by reading that racist and homophobic book, the Bible. "The women's champion is even worse, an Icelandic native whose surname refers to a Northern European pagan deity (ipso facto proof of Nazism)." It didn't take long before hundreds of CrossFit Headquarters' Facebook followers hammered the company for sharing the SBDL post. Before long, CrossFit headquarters issued a textbook non-apology apology on the social networking site. "We have decided to remove the racial satire about CrossFit from our feed. Thanks to the users who informed us that the blog's author is an actual racist — a view so pathetic that it is sometimes hard to distinguish from comedy written to mock racists. We apologize if you found this offensive." Russ Greene, a CrossFit spokesman, said that CrossFit often shares articles and essays unrelated to fitness for discussion on its Facebook page. "We consider ourselves a source of news and information," he told me Friday. "There's not this implied endorsement, which is something I think people missed." But the racist blog post and the decision by CrossFit to share it bumped up against a popular perception: CrossFit culture is, if not hostile, then at least unwelcoming to people of color. The CrossFit ethos eschews stuff like workout machines and the amenities that many big fitness chains provide, instead emphasizing stuff like Olympic lifts and gymnastics. It's kind of showily no-frills, and gyms — or "boxes," in CrossFit parlance — are often just huge garages with chin-up bars, mats and free weights. People who CrossFit together often form tight-knit cliques, leading to a reputation that CrossFit is a little culty and militaristic. Syncere Martinez, who runs a Harlem CrossFit affiliate gym said he knew it was coming. "When that [blog post went up] I can guarantee you, in the first four minutes, I was one of the first people contacted," Martinez says. He and several other prominent black CrossFitters often joke that they're the only black CrossFitters. Coincidentally, the day the Facebook apology went up, Yesha Callahan wrote an essay at Clutch about how she enjoyed watching folks perform CrossFit workouts in their open-air gyms in D.C., but wondered just where all the black folk were. "In all of my CrossFit watching one thing I did notice is the lack of black women in the classes. Since I have several friends in fitness groups catering to black women, like Black Girls Run and Black Women Bike DC, I figured I'd ask about a Black Girls CrossFit group. And that's when everyone went silent. One friend said the workout wasn't something she was interested in because of the higher possibility of injuries. Another friend referred to it as a 'fitness cult,' and she didn't see the glamour in puking and throwing around weights." Greene, the CrossFit spokesperson, and Web Smith, a prodigious Tweeter and and "one of CrossFit's 22 black people" wondered if the idea of their universe being dominated by white folks was fueled by the CrossFit Games. The Games, in which really fit people move heavy things very quickly, which are televised every year by ESPN and have gone a long way to putting CrossFit on the mainstream radar. "For better or worse, a lot of people are used to people of color doing well in sports," Greene said. "There are some, but most of the people who are the top athletes at the Games are not." The outspoken Elisabeth Akinwale is arguably the most prominent competitor of color at the yearly CrossFit Games, and she's become a celebrity of sorts while blogging about the challenges of being a mother and an athlete. Smith said Akinwale's profile might help the philosophy draw more people of color. "I don't necessarily agree with her approach, but it would be more beneficial if more people knew that she was there and that she was talented," Smith said. But Akinwale has made no public statements about the controversy, and didn't respond to my requests for comment. 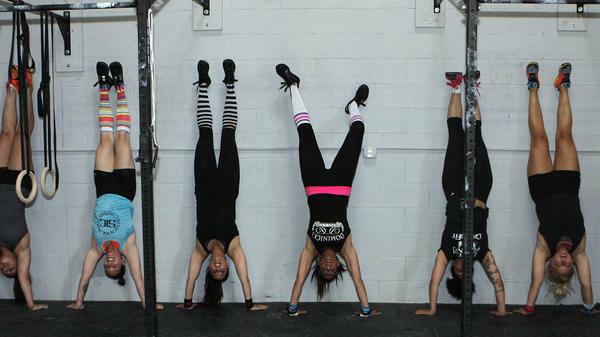 So just how white is Crossfit, anyway? It's tough to say, in part because of the company's peculiar corporate structure. People who own CrossFit gyms aren't franchisees but "affiliates" — they're licensed by CrossFit HQ but set their own rules, hours and workouts and buy their own equipment. That aversion to top-down orders is a reflection of the libertarian ideology of its founder, Greg Glassman. While Greene said that it would be interesting to crunch the numbers on CrossFit memberships, "there's no way to get the affiliate owners to record [those stats] without mandating it." As you might guess, that's a nonstarter among free enterprise types. That cost would be way out of reach for most people, but more so for people of color, who are more likely to face economic barriers to exercise. Two hundred dollars a month is an inconceivable amount for lots of people to pony up. But Smith said that there are plenty of professional black folks who could afford the membership but still don't see themselves as the kind of people who might join a CrossFit box. For that reason, he said that the controversy over the blog post might have a silver lining. "I wasn't so upset, because there's not been another time when we've been willing to discuss the fact there are no black people at CrossFit," he said. Smith and his wife were planning to open up their own CrossFit box in Columbus, Ohio, and that the recent conversation has changed his thinking. Now, the couple wants to actively reach out to black people for their gym. "Wherein the article was shameful in and of itself, [the conversation] moved us closer to focusing on something I thought was important," Smith said. "Three weeks ago, it wasn't important at all."